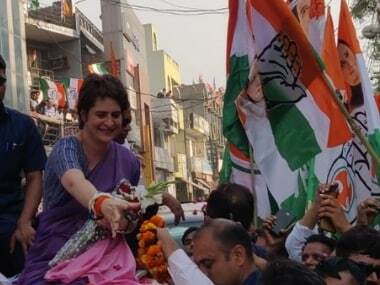 Congress general secretary and eastern Uttar Pradesh in-charge Priyanka Gandhi Vadra kicked off her party's campaign for the upcoming Lok Sabha elections with a mega three-day 'Ganga Yatra' from Prayagraj to Varanasi by a steamer on Monday. Both the start and end points of her 140-kilometre-long Ganga ride are of immense political significance — Prayagraj is the birthplace of her great grandfather and India's first prime minister Jawaharlal Nehru, and Varanasi is Prime Minister Narendra Modi's parliamentary constituency. This is Priyanka's second visit to the state after being appointed a Congress general secretary. She arrived in Lucknow on Sunday afternoon and held several meetings with party leaders for the upcoming Lok Sabha election. The Congress leader is expected to spend four days in the state. A day before she began her campaign, Priyanka wrote an open letter to the people of Uttar Pradesh, stating how she would take the help of "Gangaji" to reach their doorsteps to establish a "saccha samvaad" (truthful dialogue) with them and bring forth political change. Priyanka's letter tacitly points at Modi's reference to Ganga as his "mother" to maintain that it was "the call of Ganga Maa that had prompted him to contest from Varanasi". On Monday, her boat ride started at Manaiya ghat in Prayagraj district's Kachnar tehsil and will culminate at Sitamarhi ghat in Bhadohi district along the Ganga. On her way from Manaiya to Sitamarhi, she made her first pitstop at Dumduma Ghat, where she interacted with the villagers. 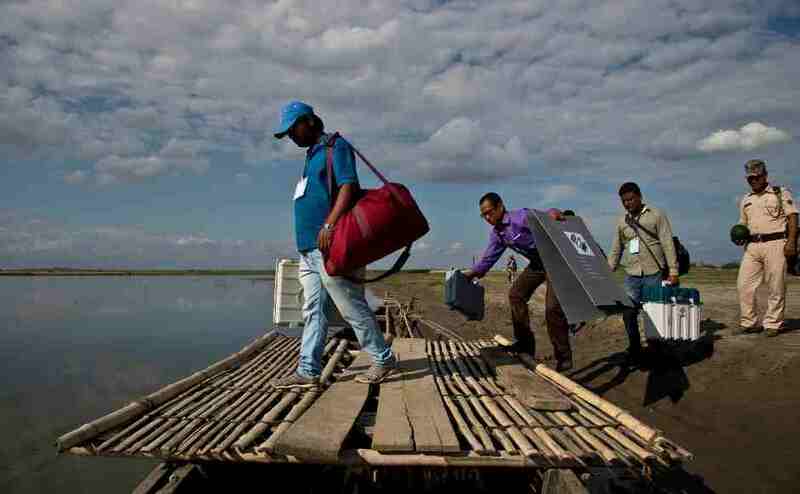 The Congress plans to connect with the Mallah, Kewat and Nishad communities of boatmen, fishermen and agriculturalists who live along the river. Before embarking on her yatra, Priyanka also visited the Bade Hanuman temple in Prayagraj and offered prayers. The 47-year-old younger sibling of Congress president Rahul Gandhi also held a discussion with students onboard the boat, which is being called "Sanchi Baat Priyanka Ke Saath". She will next reach Sirsa Ghat and continue her boat ride to Lakshagrih Ghat. She is expected to reach arrive at Sitamarhi Ghat on Monday evening. Political observers believe that Priyanka's cruise is also an effort to navigate her party out of a three-decade-long wilderness in the state. Not surprising then that she shared a tweet recalling her memories associated with Swaraj Bhawan, where her grandmother and former prime minister Indira Gandhi was born. Recalling memories of her grandmother, while she takes a tour of this politically important state, is also significant considering how she has always been likened and fondly compared by people with Indira Gandhi. Priyanka talks about how her grandmother would "put her to sleep with stories of Joan of Arc" — an apt allusion to "being fearless" as she takes the fight to Modi's stronghold. 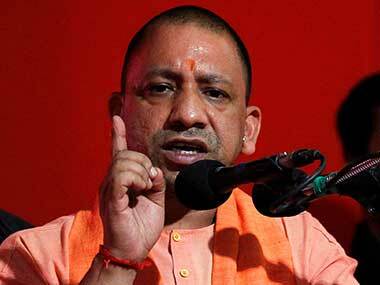 Making a pit stop to address a rally at Dumduma ghat in Prayagraj, she took a jibe at Modi's 'Main Bhi Chowidar' campaign and said, "It is up to the prime minister what he wants to put before his name. A farmer told me that chowkidars are for rich people and that farmers are their own security personnel." She also added how the country and the Constitution were in "danger". 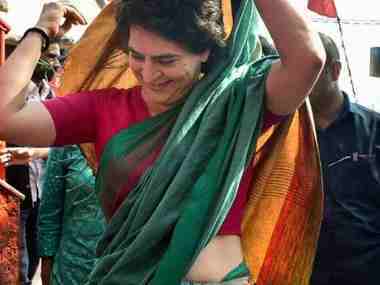 From Sirsa, Priyanka will proceed to Tutihar and Kaundhiyara by road. She is set to meet family members of slain CRPF jawan Mahesh Raj Yadav in Prayagraj and briefly stay at a guest house. On Wednesday, she is likely to visit the ancestral home of former prime minister Lal Bahadur Shastri in Varanasi, a Congress communique said. The Congress leader is expected to reach Varanasi on Thursday, where she is likely to highlight the failure of the Modi government's Namami Gange project.